Buddy Hinton is just a good ole boy. So when he disappears after a night drinking at the Black Bull, his friends just figure he went down to Mexico to find himself a girlfriend and eventually will come back. But this case quickly becomes a homicide after the sheriff discovers the missing man floating in one of his stock tanks. This is a great debut from Frank Hayes! He has created a wonderful character in Virgil Dalton. Virgil is half Native American and in addition to being the Sheriff of Hayward he is also a rancher and a lawyer. When Buddy Hinton disappears he thinks the guy has just run off but when his body is found he soon realizes big town trouble has come to the little town of Hayward. 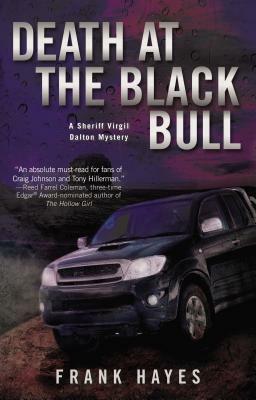 All the clues lead back to the Black Bull, a local watering hole for ranch hands on and off for 30 years. With the help of his small band of deputies and insight from his ranch manager, Cesar, and his grandfather that lives on the reservation, Virgil starts to put the pieces together and uncovers more than a few secrets. I was in the mood to read something a little different so I grabbed this book and once I started reading I couldn’t put it down. Hayes is a terrific storyteller. He is a very descriptive writer. I felt like I was watching a movie instead of reading a book. He also fleshed out his characters in a way that truly engaged me as a reader. The final twist was a real shocker too! This really can’t be Frank Hayes first novel. He is definitely an author to watch. Frank Hayes is a high school teacher who has started a new career as a novelist. He lives and writes in New York’s mid-Hudson River valley. Death at the Black Bull is his first book. This sounds like an all niter! I love your site, and you are introducing me to sooo many new authors. Please keep them coming. I really like the Sherriff Matthews series by D.R. Meredith so I bet I’ll like this one too. Thanks Lori for a chance to win your copy! Spotlight/Giveaway – First Impressions by Charlie Lovett Handcuffs & High Heels by J.M. Edwards – Great Escapes Book Tour – Giveaway too!